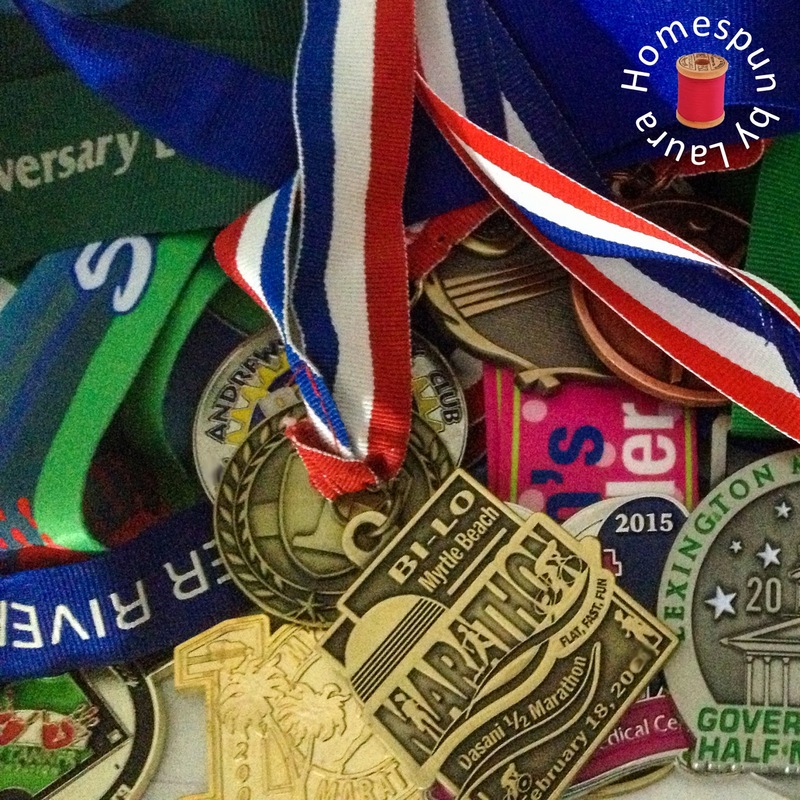 Do you have an abundance of sports medals hiding in a drawer or closet? Almost every 5k road race these days hands out a medal to finishers. Kids’ sports teams are often given trophies or medals at the end of the season. 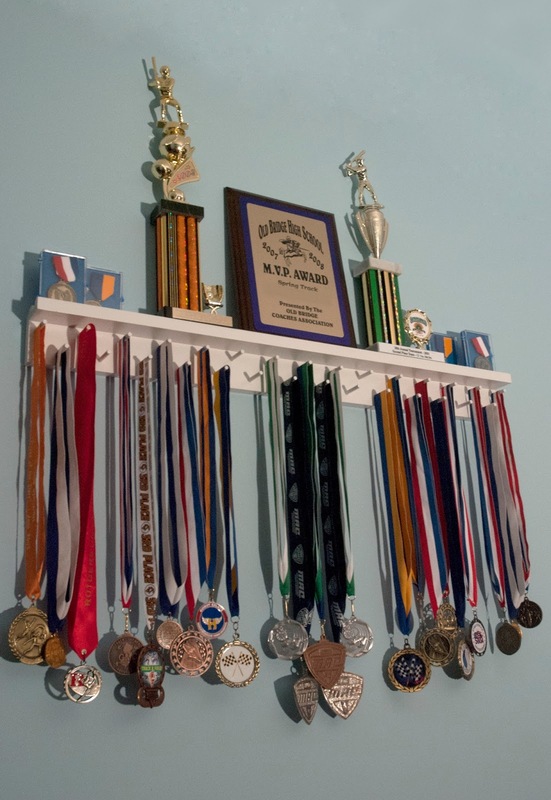 Whether earned running, swimming, biking, or kicking, this project is the perfect solution for displaying all those medals in a place of honor. The Mister and I met when we were 16 and on our high school cross country team, and running has been a major part of our lives ever since. 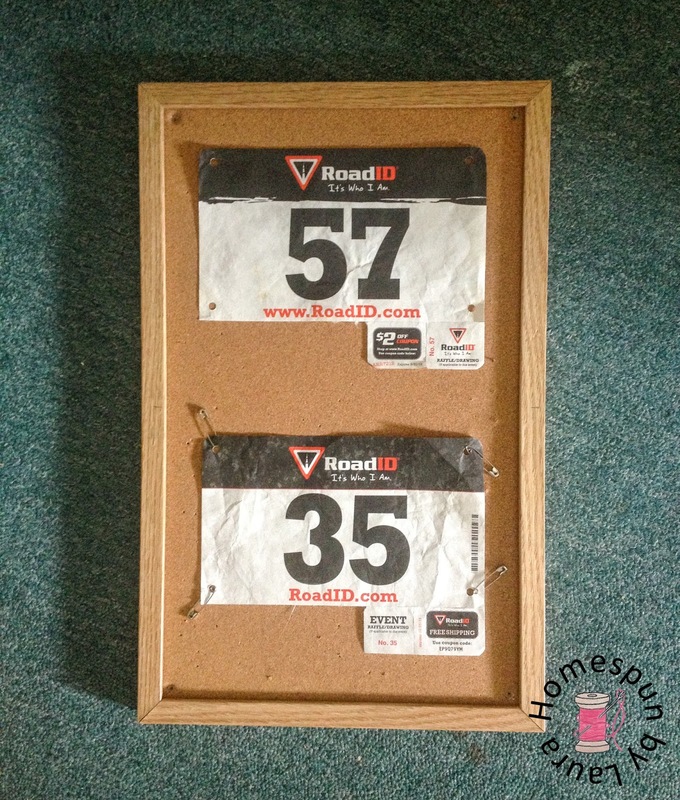 It only makes sense that it would be important to us to create a place to display the medals, plaques, and race bibs we have accumulated over the years. As part of the Fall 2015 One Room Challenge, when I focused my efforts on our office space, one project I tackled was creating a display for the aforementioned items, and today I’m sharing the DIY shelf I made for hanging our medals. I looked online for options to buy or DIY, but I couldn’t find exactly what I wanted. 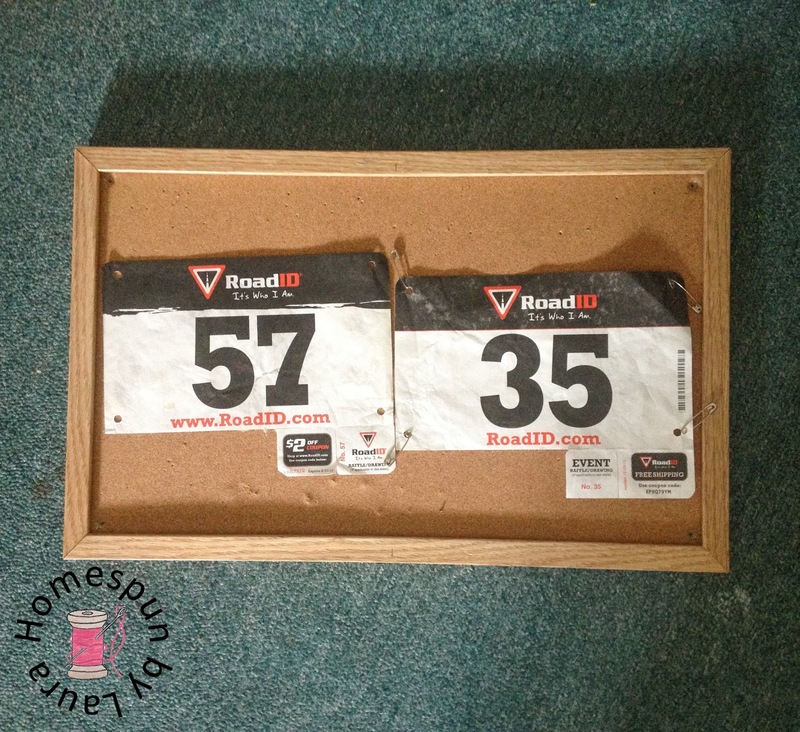 For a shelf to hang our medals, I liked the general layout of this shelf, available for sale here. It was even listed at a fairly reasonable price, but it wasn’t exactly what I was looking for. I really wanted a single rod instead of multiple pegs. I happened upon this image on my kitchen Pinterest board, and the wheels started turning in my head. It just looked a little bare on the ends of the rod, though. I then thought back to the DIY curtain finials I made last year and realized that if I combined the two ideas, I’d have the perfect display for this space! After all the paint was dry, I got to work creating my finials using toy doll heads, wooden wheels, and dowel screws. After the finials were finished, I trimmed down and painted a round poplar dowel and screwed my new finials into the ends of it. For the shelf, I originally bought these fancy scroll brackets but wound up taking them back because they stuck out almost 8″ from the wall, and my shelf was only 6″ deep, so that would have been weird. …so it was back to the drawing board. 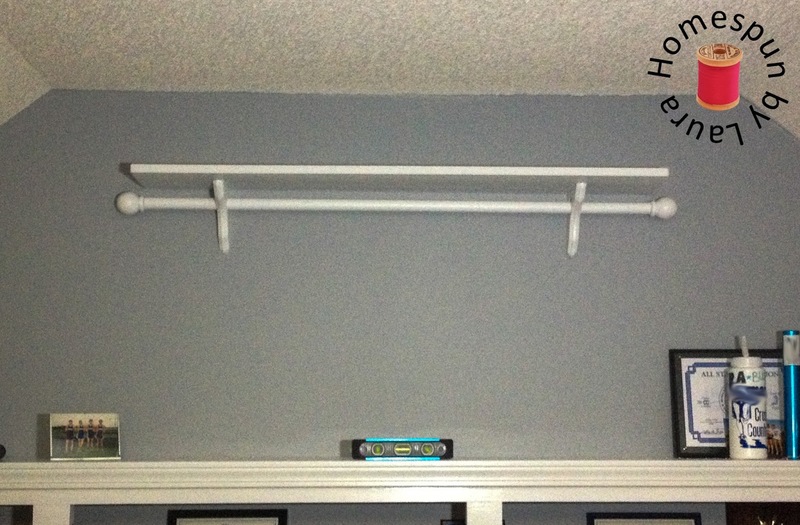 I recalled coming across this idea when I was searching for a cheap economical way to create the DIY curtain rods in our den last year, and realized it would work perfectly. 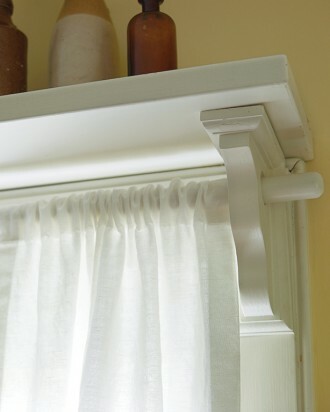 I switched out my fancy scroll brackets for a couple of plain pine brackets and dug out the 1.5″ hole saw I bought two years ago to use on our kitchen hutch. It was exactly what I needed to make an opening in these pine brackets for my 1.25″ dowel to easily fit through. holes into the brackets, but I can’t find them anywhere. I then enlisted the Mister’s help hanging the shelf. The task of arranging all of our medals in chronological order took some time but seemed absolutely necessary to me. Hanging them all up on the shelf was a much quicker process. The Mister’s are on the left and mine are on the right, with our most recent ones on the outsides so it’s easier to add new medals chronologically as we earn them. I framed a photo of both of our high school 4x800m relay teams, and added them to the top of the shelf with a few plaques and trophies. Several other mementos from our nearly 20 years of running found a home on the built-in below our new medal display unit. 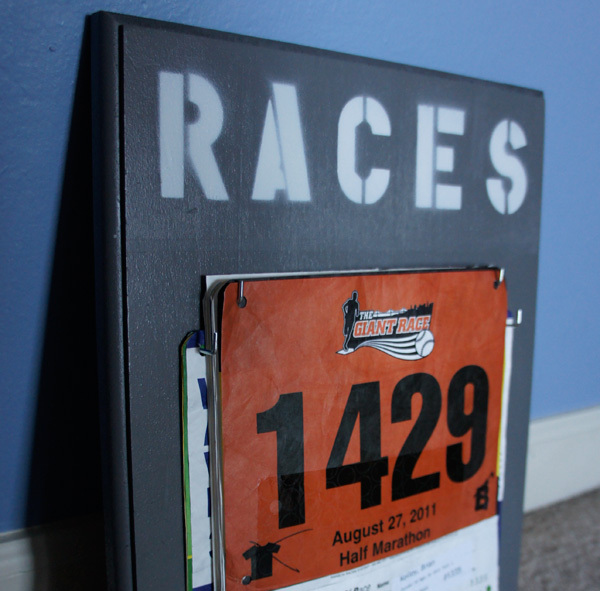 It’s like a little running museum featuring us (don’t make the mistake of thinking we’re amazing runners – we’re not!). I LOVED those hot pink track spikes, and the Mister’s cross country flats are on display nearby, too. I’ve considered picking up a couple packs of shower curtain rings like these to hang the medals on so they’ll all fall the right way (medals are of course made to fit a neck – which is vertical, but the rod is horizontal, so they like to turn to one side a bit). But it hasn’t bothered me enough yet to go to the trouble of taking them all off and re-hanging them! There needed to be a stack for the Mister’s bibs and a stack for mine, so I tried a few different layouts before finding the best fit. 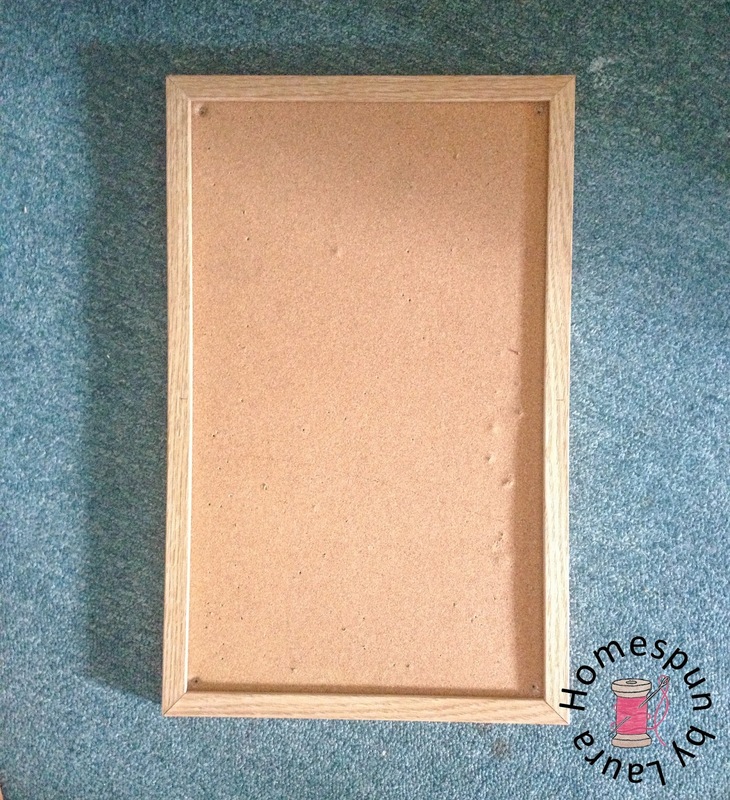 It doesn’t look like much – yet! …and added our bibs. I might decide to paint it one day to match the dart board on the other side of the room, but for now I like it. The total cost for both display pieces was somewhere around $15. A few of the materials I used were left over from previous projects. We’re both pleased with the result – it looks great, serves a purpose, and didn’t break the bank. Plus, we can see all of our combined running awards at once. Can’t beat that! I think it looks a little busy in the pictures, but it looks great in person! I should work on the shelves below this soon, though…they’re a mess! Together with the rest of the work I’ve been doing in the office lately, this corner of the room has seen some drastic changes! 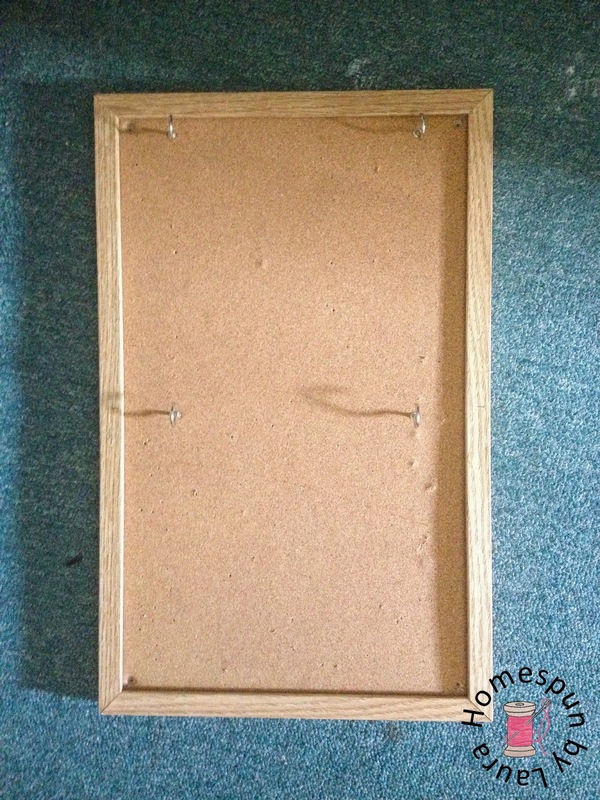 Have you made a similar project? 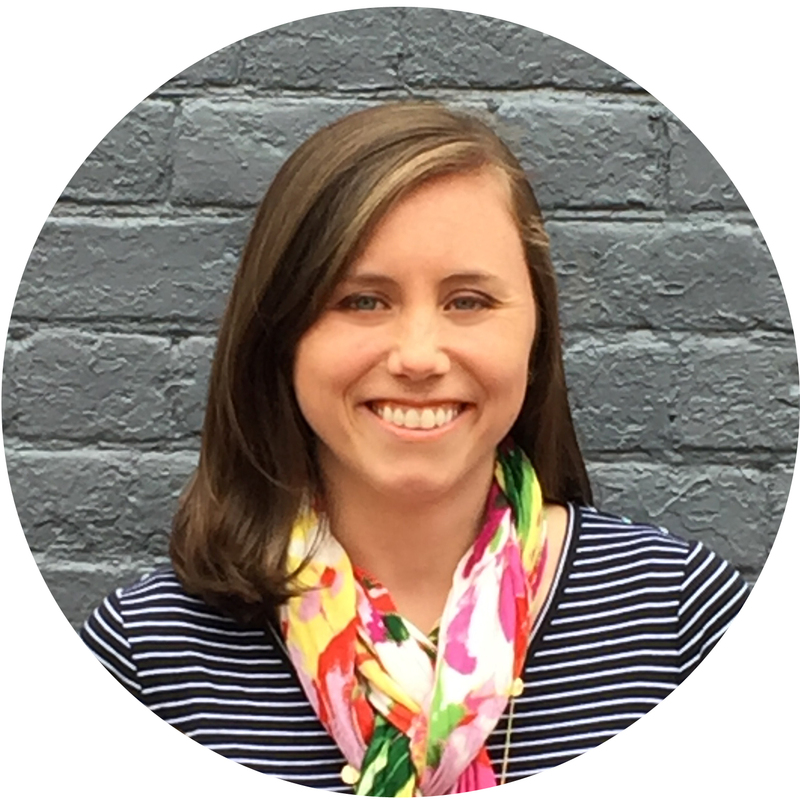 Use the hashtag #homespunbylaura to share it on social media! I’d love to see it.